Tennessee native Clay Millican (Top Fuel) and Greg Anderson (Pro Stock) also emerged as preliminary No. 1 qualifiers in their respective categories at Bristol Dragway during the 11th of 24 events on the 2018 NHRA Mello Yello Drag Racing Series schedule. 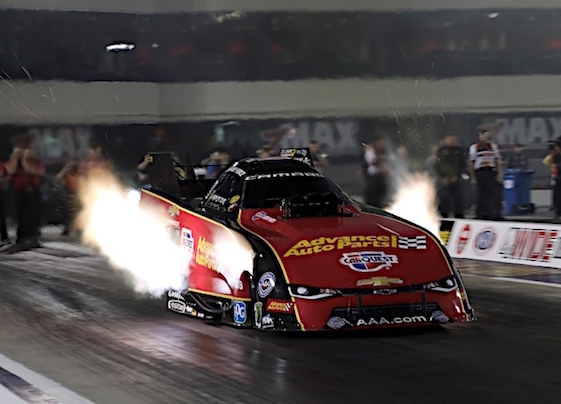 Force earned P1 after a 1,000-foot pass of 3.993-seconds at 325.92 mph in her Advance Auto Parts Chevrolet Camaro SS recorded during her second run, as she was the only driver to crack the four-second mark. The current point leader is seeking her seventh pole of the year and fifth in the past six events. J.R. Todd sits second with a 4.072-second pass at 313.15 mph in his DHL Toyota Camry, also set during the second session. Millican powered into the Top Fuel lead with a 1,000-foot run of 3.817-seconds at 322.88 mph in his Great Clips/Strutmasters dragster during the second session. The defending event winner is aiming for his fifth pole of the season, as he also chases his third event victory in the past four races. Eight-time world champion Tony Schumacher is second at 3.830-seconds and 323.66 in his U.S. Army dragster. Anderson leads Pro Stock after covering the traditional quarter-mile in 6.674-seconds at 205.35 mph in his Summit Racing Equipment Chevrolet Camaro SS on his second pass. The four-time world champion from KB Racing is chasing his seventh pole of the season and third in a row. Five-time world champ Jeg Coughlin Jr. is second following his 6.683-second pass at 205.22 mph in the JEGS.com/Elite Performance Camaro SS, also run during the second session. Top Fuel _ 1. Clay Millican, 3.817-seconds, 322.88 mph; 2. Tony Schumacher, 3.830, 323.66; 3. Antron Brown, 3.832, 319.67; 4. Scott Palmer, 3.863, 319.82; 5. Brittany Force, 3.875, 320.20; 6. Steve Torrence, 3.879, 321.81; 7. Dom Lagana, 3.886, 321.19; 8. Mike Salinas, 3.917, 314.97; 9. Shawn Reed, 4.019, 263.62; 10. Leah Pritchett, 4.129, 224.25; 11. Doug Kalitta, 4.419, 187.08; 12. Richie Crampton, 4.626, 169.81; 13. Terry McMillen, 4.724, 159.34; 14. Pat Dakin, 4.874, 152.66; 15. Terry Totten, 6.899, 84.96. Funny Car _ 1. Courtney Force, Chevy Camaro, 3.993, 325.92; 2. J.R. Todd, Toyota Camry, 4.072, 313.15; 3. Robert Hight, Camaro, 4.077, 316.97; 4. Bob Tasca III, Ford Mustang, 4.078, 312.06; 5. Cruz Pedregon, Camry, 4.109, 304.05; 6. John Force, Camaro, 4.115, 313.51; 7. Jack Beckman, Dodge Charger, 4.130, 307.86; 8. Tommy Johnson Jr., Charger, 4.167, 303.03; 9. Shawn Langdon, Camry, 4.191, 299.00; 10. Matt Hagan, Charger, 4.192, 296.24; 11. Jim Campbell, Charger, 4.215, 295.98; 12. Jeff Diehl, Toyota Solara, 4.298, 290.13; 13. Del Worsham, Camry, 4.335, 231.91; 14. Ron Capps, Charger, 4.362, 215.93; 15. Tim Wilkerson, Mustang, 4.457, 201.79; 16. Jonnie Lindberg, Mustang, 5.346, 138.33. Pro Stock _ 1. Greg Anderson, Chevy Camaro, 6.674, 205.44; 2. Jeg Coughlin Jr., Camaro, 6.683, 205.26; 3. Drew Skillman, Camaro, 6.685, 204.82; 4. Tanner Gray, Camaro, 6.688, 205.60; 5. Alex Laughlin, Camaro, 6.692, 203.58; 6. Jason Line, Camaro, 6.700, 204.57; 7. Deric Kramer, Camaro, 6.703, 204.82; 8. Vincent Nobile, Camaro, 6.703, 204.08; 9. Bo Butner, Camaro, 6.704, 205.07; 10. Chris McGaha, Camaro, 6.706, 205.91; 11. Erica Enders, Camaro, 6.710, 204.66; 12. Tim Freeman, Camaro, 6.744, 202.94; 13. John Gaydosh Jr., Camaro, 6.800, 203.12; 14. Tommy Lee, Camaro, 7.012, 193.88; 15. Alan Prusiensky, Dodge Dart, 10.396, 87.04; 16. Wally Stroupe, Camaro, 13.947, 60.12. Steven Whiteley secured the provisional pole Friday during the E3 Spark Plugs NHRA Pro Mod Drag Racing Series presented by J&A Service portion of the Fitzgerald USA NHRA Thunder Valley Nationals at Bristol Dragway. This weekend’s Pro Mod racing, presented by Elite Motorsports, is the sixth of 12 events this season. Whiteley covered the quarter-mile in 5.823-seconds at 250.51 mph in the second session in his J&A Services/Y-Not Racing 2018 Chevrolet Camaro to take the top spot. Rick Hord currently sits second with a 5.855-second pass at 251.72 mph. Pro Modified _ 1. Steven Whiteley, Chevy Camaro, 5.823-seconds, 250.51 mph; 2. Rick Hord, Chevy Corvette, 5.855, 251.72; 3. Mike Castellana, Camaro, 5.855, 249.58; 4. Mike Janis, Camaro, 5.861, 244.07; 5. Jeremy Ray, Corvette, 5.870, 244.47; 6. Rickie Smith, Camaro, 5.872, 245.18; 7. Khalid alBalooshi, Camaro, 5.872, 244.78; 8. Bob Rahaim, Camaro, 5.908, 246.39; 9. Danny Rowe, Camaro, 5.919, 246.75; 10. Troy Coughlin, Ford Mustang, 5.928, 247.84; 11. Chad Green, Camaro, 5.939, 245.63; 12. Jeffery Barker, Pontiac GXP, 5.952, 250.69; 13. Sidnei Frigo, Corvette, 5.954, 248.34; 14. Michael Biehle, Mustang, 5.958, 246.75; 15. Jim Whiteley, Camaro, 5.960, 241.07; 16. Pete Farber, Dodge Daytona, 5.964, 239.31. Not Qualified _ 17. Chip King, 5.966, 241.20; 18. Todd Tutterow, 5.992, 242.32; 19. Brandon Snider, 6.004, 241.45; 20. Doug Winters, 6.013, 239.06; 21. Richie Stevens, 6.171, 240.38; 22. Steve Jackson, 6.228, 201.97; 23. Clint Satterfield, 6.345, 235.31; 24. Harry Hruska, 6.928, 170.69; 25. Eric Dillard, 7.654, 139.33; 26. Steve Matusek, 7.739, 124.50; 27. Chuck Little, 7.866, 84.23; 28. Dan Stevenson, 8.313, 158.82; 29. Erica Enders, 9.011, 101.81.